The national L’Oréal-UNESCO Award for Women in Science launched in 2007 aims to recognize and support young female investigators in Argentina. This year, the projects should focus within the framework of: Medical Sciences, Biology, Biochemistry, Veterinary, Biotechnology and Physiology. The goal of this prize is to award scientific excellence by promoting and stimulating the participation of women in science. The prize consists of the sum of $100.000 and aims to provide financial support for the investigator’s project for her to continue developing her ongoing project within the country. In addition to the first prize, two mentions will be awarded with $10.000 each. – Women with PHD/ doctoral degree who have not reached the age of 50 before June 30th. -Women who conduct their research projects in our country in the field of Life Sciences: Medical Sciences, Biology, Biochemistry, Veterinary, Biotechnology and Physiology. – Women who presented their projects in previous editions and were not selected. Those candidates who received special mentions in other editions can apply again for the prize but they will be exempted from receiving special mentions. The winner will be selected by a jury consisting of recognized experts in the field and representatives from the National Scientific and Technical Research Council (CONICET), the National Commission for Co-operation with UNESCO and L’Oréal authorities. “Currently, 49% of CONICET investigators are women. Inclusion policies and gender equality for women within the scientific field have been fundamental for the Council because it highlights the role of women in the generation of knowledge”, stresses Roberto Salvarezza, president of CONICET. “This is the 7th Edition of this award and we feel very proud for that. 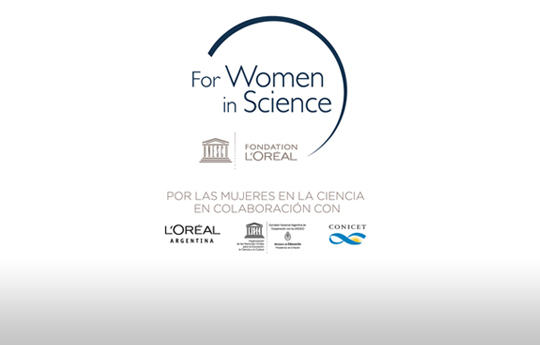 In the context of this L’Oréal-UNESCO International Programme, this national prize allows to support Argentine female scientists and their projects because we are convinced that the world needs science and science needs women”, Silvia Tripoloni, L’Oréal Argentina Managing Director for Public Relations and Communication, commented.